Jacked Up | Are You Zhazha? I prefer the kind of flats that are waiting for me – as opposed to the ones that happen as I’m driving down a busy interstate. This one was safely hanging out for me on Level 4 of the parking garage. Swell! I shouldn’t refuse the kind offer of help from strangers. My stubborn “I got this” personality caused me to turn four people away. I gave some line about being “woman, hear me roar” and immediately felt dumb after it. Glad I admitted defeat and reluctantly accepted the fourth offer of help after trying to loosen the lug-nuts with my cute purple pumps. 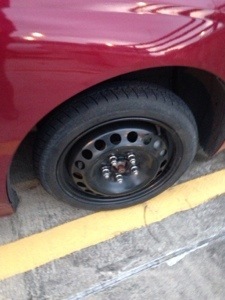 Andrew had tightened those lug-nuts with the “intensity of the sun” as I heard him once use to describe Nate. During my attempt to break the lug-nuts free, I called Andrew, out of breath, verifying, “It’s lefty loosey still, right? !” He responded yes and told me he was on his way to help. That’s also when the fourth person to offer help showed up and didn’t take no for an answer. He just started fixing it. There’s a special place for the jack under my car. If you don’t use it, you will bend the area near the door frame. That happened. I now need new tires and some body work. It’s very difficult for me to drive slower than 55 mph. Thank goodness for cruise control. Glad I had that padiddle light too. That really added to the comedy of the situation.